I've mentioned Bitcoin a number of times on this blog. It is something our firm is watching closely. We thought briefly about making a Bitcoin specific investment earlier this year but ended up deciding to sit on the sidelines for now. We are quite taken with the idea of a currency that is not controlled by governments and central bankers and that is based on faith in an algorithm and a network instead of the "full faith and credit" of a country. 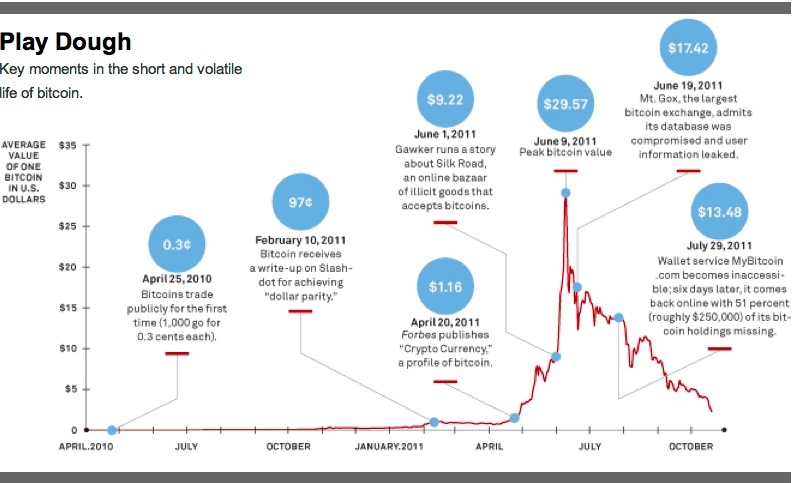 Wired has a good post on the history of Bitcoin. It's a quick read. If you are at all interested in this topic, I suggest you check it out. You could take that as a sign that Bitcoin has failed. 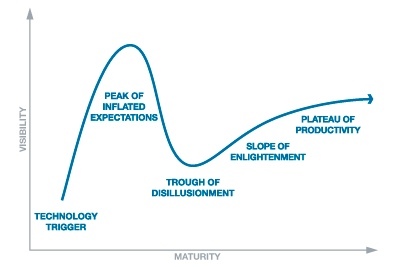 Or if you put that chart in the context of the Gartner "hype cycle" chart, you could say that we just went through inflated expectations and now we are into the real work. The hype cycle model rings so true to me because it maps out what has happened with the commercial Internet over the past fifteen years. In 2002/2003, so many people thought the Internet was "over" as an investment opportunity. And they were wrong. So it seems to me and my colleagues at USV that an alternative currency with roots in peer to peer networks and based on an algorithm that is transparent to everyone is an idea whose time has come. The question remains if the Bitcoin algorithm or some other algorithm (possibly a derivative of the Bitcoin algorithm that deals with some of Bitcoin's weaknesses?) will ultimately win out. That's an important issue that has a lot to do with when this space becomes investable. But Bitcoin or something else, I'm confident we'll see the emergence of currencies that are not controlled by nation states in my lifetime. Whether that is a good thing or not remains to be seen. I think it is, but there are significant ramifications that will result from the decoupling of currencies from governments. And one of them is an interesting investment opportunity that we hope to participate in.